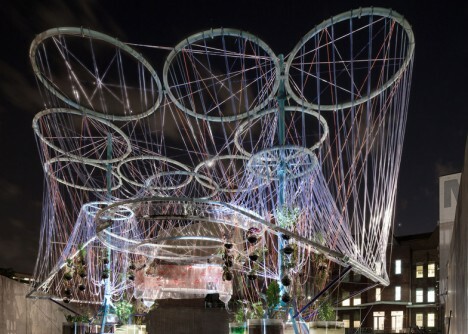 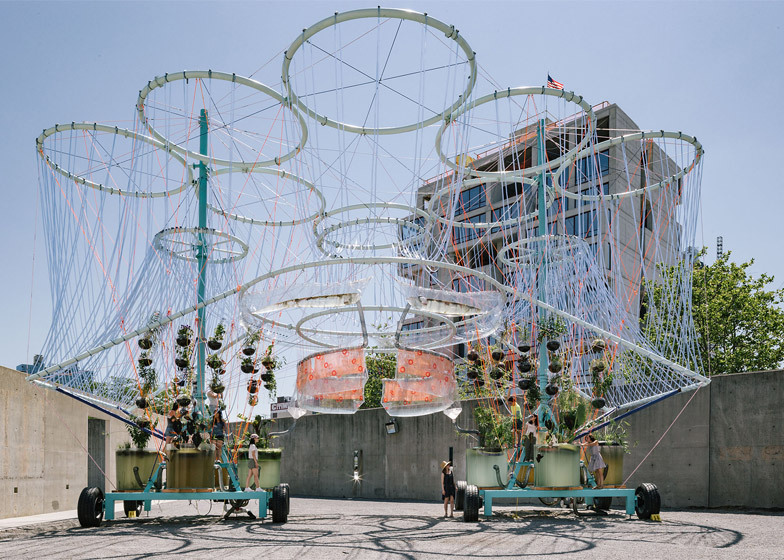 Combining practical water purification and the fun of watching hidden processes come to life, this gigantic structure installed at MOMA PS1 in New York City features a dazzling array of plants and pipes made to be watched and enjoyed by people. 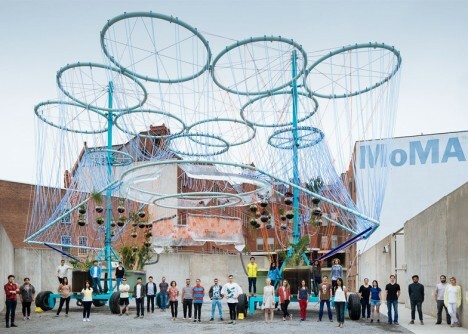 Developed by Andrés Jaque’ and his architecture firm, winner of the 2015 Young Architects Program, this mobile filtration plant (dubbed Cosmo) takes in polluted water supplied by the city (from or) matching pollution levels of the East River and renders it clean and drinkable. 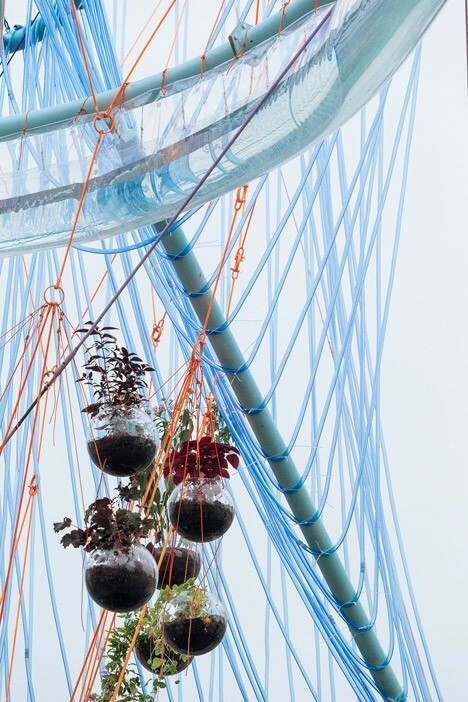 Filtering out particulates, balancing acidity levels and introducing dissolved oxygen, the array of spiralling tubes can process nearly 1,000 gallons of water a day, with all its functions on display. 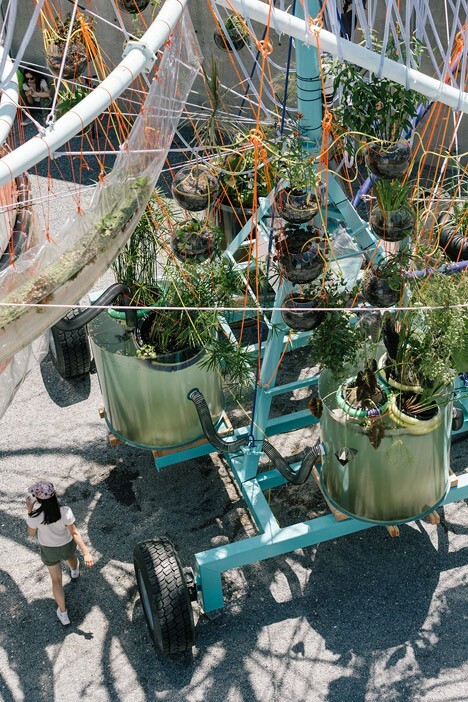 Two portable four-wheeled rolling vehicles below can be pushed to wherever the party may be. 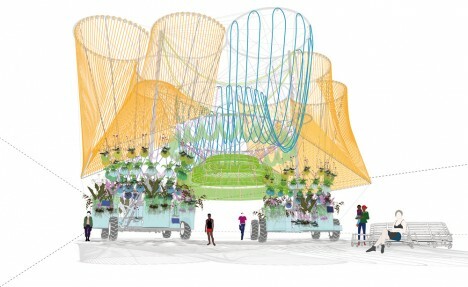 The design brief called for shade, seating and water, the last of these clearly dominates this particular winner. 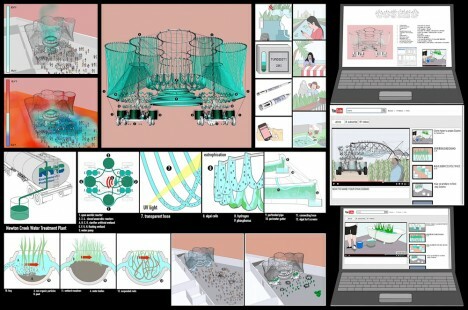 “This year’s proposal takes one of the Young Architects Program’s essential requirements–providing a water feature for leisure and fun–and highlights water itself as a scarce resource,” said Pedro Gadanho, Curator in MoMA’s Department of Architecture and Design. 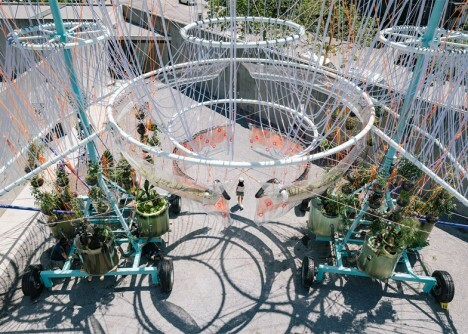 “Relying on off-the-shelf components from agro-industrial origin, an exuberant mobile architecture celebrates water-purification processes and turns their intricate visualization into an unusual backdrop for the Warm Up sessions.” (Photography by Miguel de Guzmán).